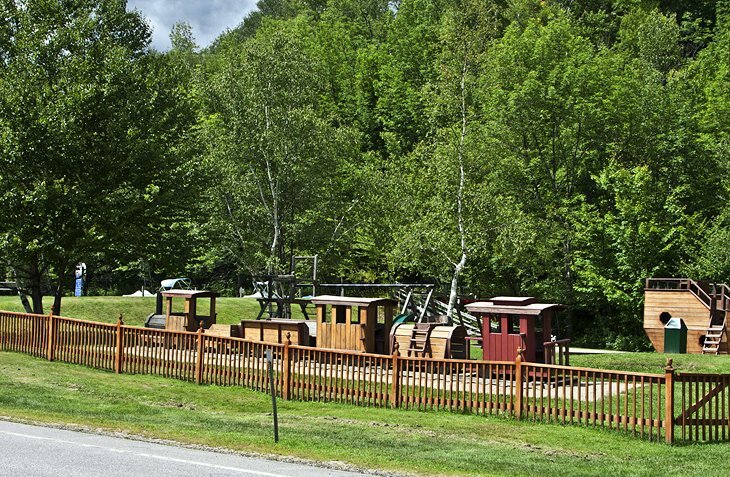 Although Lost River Valley is a privately owned campground, it is surrounded by the White Mountain National Forest and close to major tourist attractions, including Lost River Gorge, the Kancamagus Scenic Byway, and the many sights in Franconia Notch. The 125 riverside campsites are well spaced and screened by forest; some have RV hook-ups and there are attractive camping cabins. Along with basic staples and supplies, at the camp store, you can also buy ice, LP gas, and firewood. Reservations are not accepted between late June and Labor Day, during which period there is also a three-night minimum stay. Children will like this campground for its many activities: a sandy beach, paddleboat and kayak rentals, game room, tennis and badminton courts, basketball, volleyball, and a playground with a wooden train. The two adjacent mountain streams are stocked with brook trout. In the southwestern part of the state, 400-acre Greenfield State Park includes Otter Lake, where campers will find a 900-foot swimming beach reserved for their use only. Another beach is used by day visitors. Boats, canoes, and kayaks are available for rent in July and August, and the undeveloped lake is good for fishing. The 252 campsites are well spaced, but some are fairly open, under tall trees with little underbrush for screening. There are no hook-ups, although RVs are welcome in the larger sites. About half the sites can be reserved in advance. Along with the campground and lake, the park includes ponds and bogs, with woodland trails for exploring them. This is a favorite park for those climbing nearby Mt. Monadnock.